Microfiber is made from 100%polyester. You will feel it soft, comfortable. 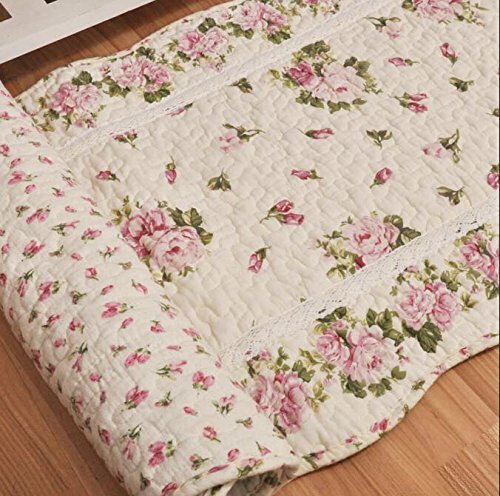 This cotton rug has high quality,rose flowers shaped design,soft and lovely,delicate quilted,suitable for bedroom,sofa,foyer,living room,tea table. Particle back antislip ,Slightly antiskid and with a Non-slip Mat will be better ,add your floor colorful,romantic and comfortable.Easy to clean,water temperature 30 degrees under neutral detergent,hand wash or machine wash all can be,do not bleach,do not dry clean,anti-exposure. We provide the best service,hope our rug can bring you and your family infinite happiness. 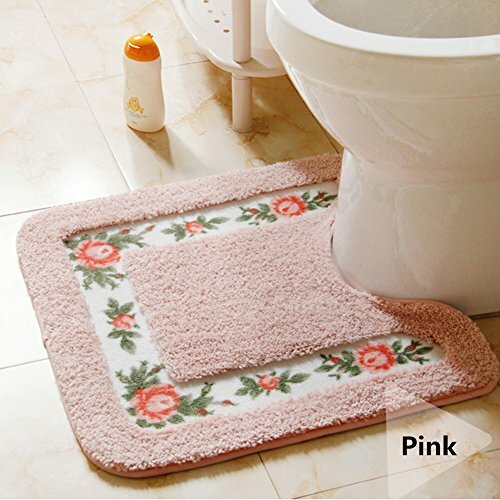 Features: Microfiber bath mats, soft, comfortable, non-slip latex bottom, easy to clean. 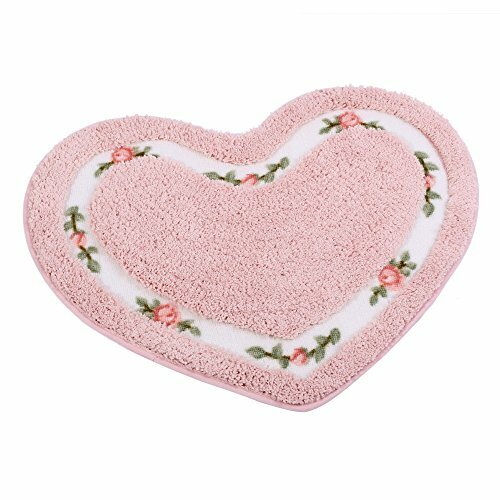 Super soft bath mat allows you to set foot more soft skin-friendly. 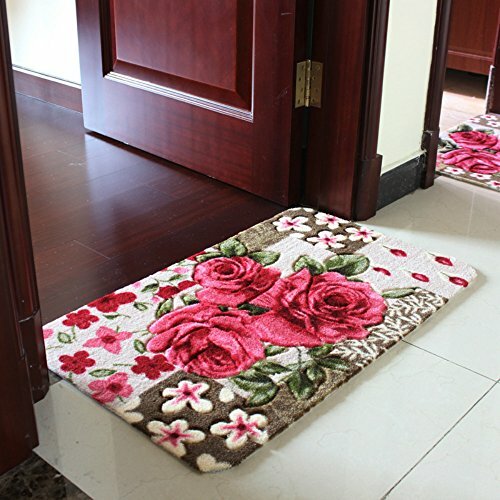 Strong absorbent get the bath mat quickly dry, Anti-slip bath mats,do not hurt the floor,very durable,stain resistance. 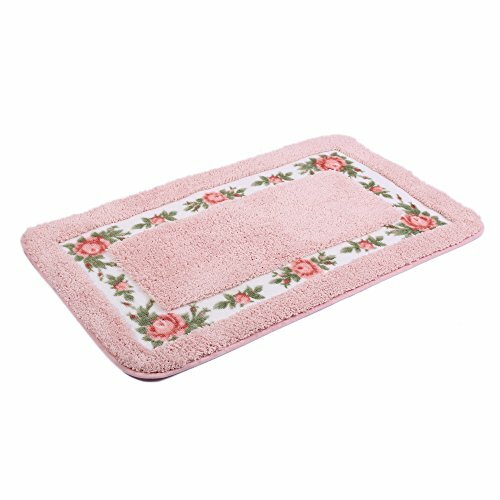 You can use this bath mat for bathroom,living room,bedroom,kitchen,bathtubs,toilet areas,hotel etc. Elegant floral pattern design shows a beautiful decoration for your home! Package Including: 1 x bath rug Wahing Note: Vacuum regularly. Spot clean spills immediately by blotting with damp cloth or sponge using cold water and mild detergent. Air dry flat. Washing Tips： ☑Machine wash separately in cold water.,immediately wash when it soaked in water. ☑Use mild detergent under30 degree. ☑Do not soak in the water for long time. ☑Do not bleach or dry clean. ☑Do not wring. Hang to dry. ☑Can be ironed under medium temperature mode. 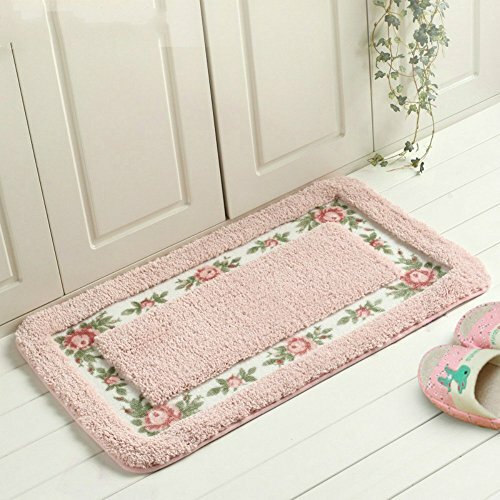 With a soft and comfy design, this lovely heart rug features a border of pretty roses and greenery on a white background. Skid-resistant backing. Machine wash. Latex and polyester. 25 1/2" x 19 1/2". Enjoy these benefits when you use MAXYOYO Area Rugs/Carpet: Convenience: Vivid colors on this carpet won't fade over time. This Rug will instantly add fashion to any room's decor. This rug features trendy colors as well as its design Comfort: Carpet come in ultra soft flannel,it is breathable,comfortable and healthy for your family. How to maintain: Hand washable, machine washable, avoid using of detergent with bleach ingredients Package Includes 1 carpet,size:79 by 94 inch,thickness:2cm Smell Description The Carpet will be packed in sealed plastic bags immediately after it produced As a new goods,it's just need put in a ventilated place when you recevied it. It will no smell very soon. And please don't worry ,the mat made by environmental material Crease and thickness This carpet are folded and compressed in bags for transportation. So when the product arrive at your address,there may be some creases,but these dents will disapper soon. NOTE: As different computers display colors differently, so the color of the actual item may vary slightly from the above images. 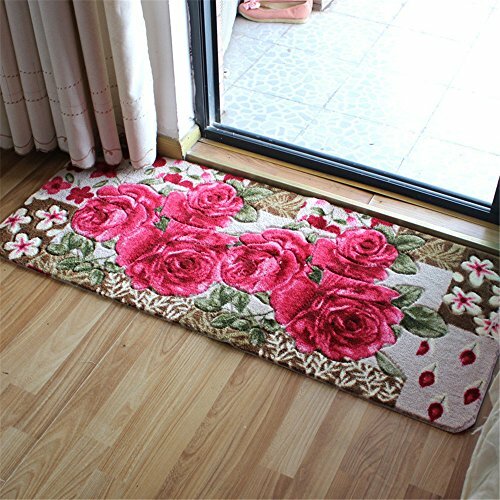 Ukeler luxury microfiber bathroom rugs collection features attractive solid color rugs with special long shag design. Place one outside of your bath tub or shower to provide a soft, water-absorbent solution or in front of your vanity to give bare feet a cushy feel. 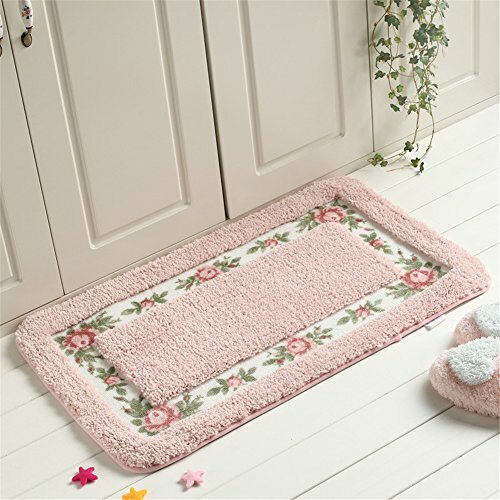 This antibacterial soft bath mat has non slip rubber backing design, very safe. 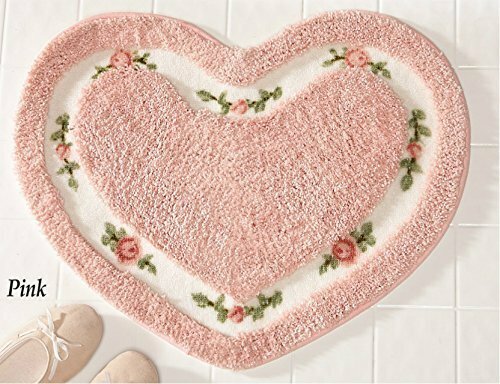 This bath rug is easy to care, 100% machine washed. 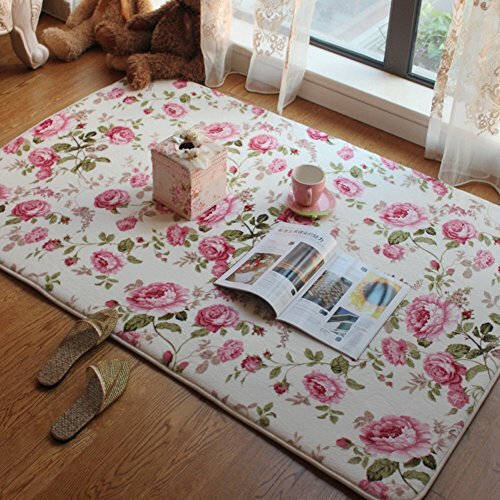 Compare prices on Rose Floral Rug at ShopPlanetUp.com – use promo codes and coupons for best offers and deals. We work hard to get you amazing deals and collect all available offers online and represent it in one place for the customers. Now our visitors can leverage benefits of big brands and heavy discounts available for that day and for famous brands.